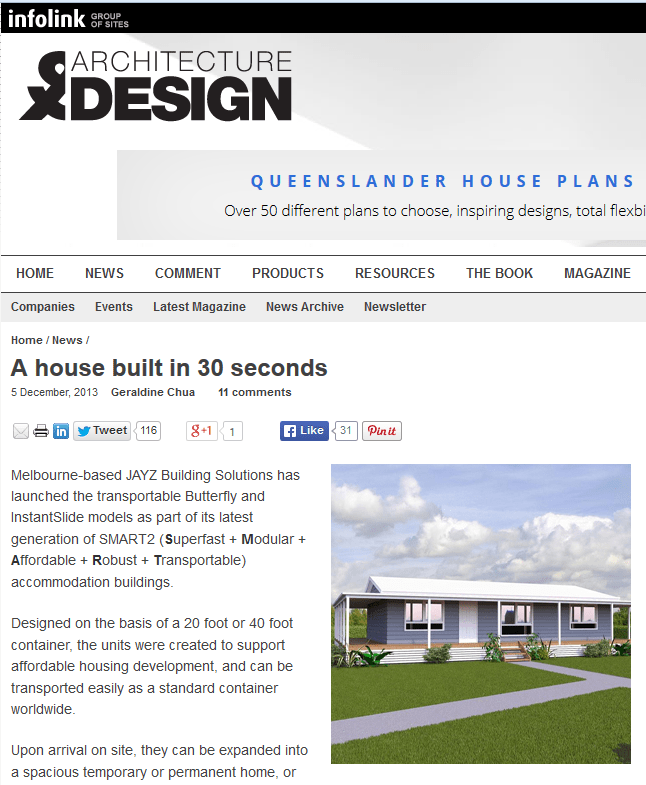 Architecture & Design has published in its website a news article entitled “A House Built in 30 Seconds”. Melbourne-based JAYZ Building Solutions has launched the transportable Butterfly and InstantSlide models as part of its latest generation of SMART2 (Superfast + Modular + Affordable + Robust + Transportable) accommodation buildings. Designed on the basis of a 20 foot or 40 foot container, the units were created to support affordable housing development, and can be transported easily as a standard container worldwide. Upon arrival on site, they can be expanded into a spacious temporary or permanent home, or attached to existing buildings as an extension. The JAYZ InstantSlide model can be assembled in 30 seconds at a touch of a remote control button. It can be built at either 25sqm or 50sqm, and fits two to four people. On the other hand, the Butterfly models are developed with a fold-out design, and can be installed on site in less than four hours with just four workers. This house can accommodate two to eight miners, and is available in two sizes – 42sqm or 82sqm. Looking to provide good facilities, including individual bathrooms, bedrooms and even high-speed broadband, JAYZ business development director Jackson Yin said the models were created with fly-in, fly-out miners in mind. “The Butterfly and InstantSlide houses provide outstanding living and working conditions in even the most remote locations,” says Yin. Designed for a 50-year lifespan and fully compliant with Australian building codes and other electrical and plumbing standards, the buildings include pre-installed bathroom and kitchen cabinets, and hard wiring for lighting, television, internet and telephone. They are also robust, and can withstand weather conditions, including earthquakes up to 7.6 magnitudes and cyclones up to 270 kilometres per hour. These modular homes can be unloaded by a forklift, self-discharging truck or crane onsite, and are made specifically for land transportation. With a 6-star energy rating, recyclable panels used enhance the house’s lifecycle, while onsite installation produces no waste or pollution. The products also demonstrate good acoustic insulation, thermal insulation, waterproofing and fire proofing. According to Yin, the design and time-saving features of the models would address key issues associated with a long-distance commuter workforce. “Thanks to patented technologies, the container-based design helps save significant time and money for our clients during the transportation and onsite installation,” he says.